As a visitor from the left coast, I was kindly invited to submit a guest blog to Jersey Pie. In keeping with the Summer Road Trip theme, this submittal recounts, in part, a trip with half of JerPie to Washington DC via the New Jersey Turnpike. This being a four-hour drive, it was necessary to take our chances with lunch at a turnpike service area. It was a service area, apparently much like any service area, offering: Carvel, Nathan's Cinnabon and Roy Rogers fare. JerPie enjoyed RR’s fried chicken and biscuit, my other half dined in characteristic, health-minded manner on Caesar salad, while I can’t remember what I ordered. Chicken Caesar, maybe. No matter. The important item, displayed near the cash register as a last-minute, impulse gottahaveit, was a small box, measuring 4 _ inches square, picturing three plump, shiny, cherries, and cooing, “Baked CHERRY PIE.” Yes, the capitalization is correct. Yes, they seemed to feel it necessary to assure me that this CHERRY PIE was baked. I have the box before me now, and next to the plump, juicy cherries is the legend, “table talk.” Now, I have been a follower of Jersey Pie since it began, and I knew my duty. Further, I knew the words, “gelatinous,” “goo,” “irascible” and “booger.” Unafraid, I paid me my money down, stoutheartedly prepared to dive into a confection to which those words might well be applied. This baked cherry pie contained no nut shells, even though it was “manufactured in a facility that also produces products containing treenuts.” Thank god for that. Enough for the praise part of this report. 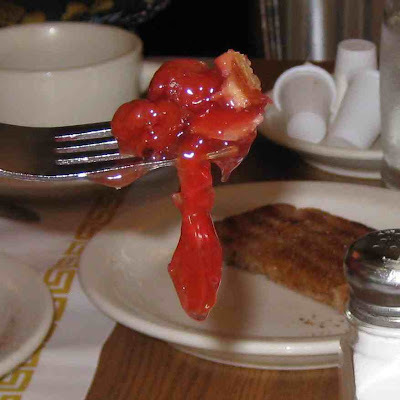 This lackluster little product of Worcester, MA 01610 contained 7 rather deflated cherries in a matrix of gelatinous goo. 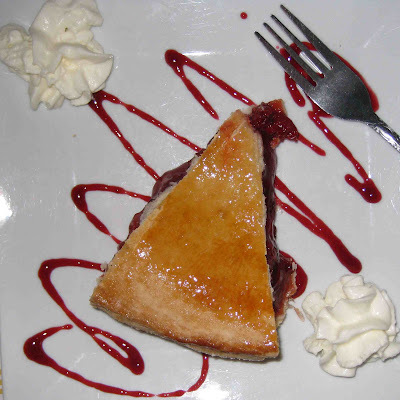 The crust was what passes in almost all eateries as pie crust, as opposed to cookie or shortbread or puff pastry crust. Well, I’m sorry, but as a pie baker I must assert that merely being clearly recognizable as pie crust does not an A+ pie make. When I make a cherry pie, the ingredients are cherries, flour, sugar, Crisco, water, almond extract, cornstarch and salt. When table talk makes a cherry pie, the ingredients are “wheat flour, water, cherries, sugar, palm oil, modified food starch, salt, potassium sorbate and sodium propionate (preservatives) nonfat dry milk, dextrose.” More water than cherries? So that’s how they make their goo! Here is a sentence from a blog: “Modified food starches are used in a mind-boggling variety of products - luncheon meats, orange juice, baked goods, biofuels, bioplastics, and the list goes on. . . .” So THAT’S why we all want to nibble bioplastics! Another ingredient, palm oil, is discussed in a pdf download titled, “Cruel oil: how palm oil harms health, rainforests and wildlife.” Read it and weep. It does, at least, explain how this tiny dessert came to have a whopping 9 grams of saturated fat. My personal daily allowance of sat fat is 10 grams. And that baked cherry pie was not a good way to use up my quota. I’m beginning to feel a bit mean-spirited and critical. After all, table talk must, at its inception, have said to itself, “Let us try to insert a bit of tasty home cooking into the monotonous life of the long-distance traveler,” then run up against the vagaries of mass production. Maybe this is the best that can be done under the circumstances. But when far from home, in a 7/11 or service area, stricken by a NEED for a sweet treat—oh, yes. It’s Snickers, hands down. Washington, DC was a whirlwind of concentrated activity, all very nourishing and satisfying. Upon return to Jersey, a wonderful field trip to a most-refreshing nature preserve restored my biobalance, and I was delighted to return to the search for a passable cherry pie. New Jersey rightly deserves the sobriquet, “The Garden State.” It is truly lovely, with tall, stately hardwoods gracing its gently rolling hills. The Palisade is a natural wonder that I could stare at for days on end. My own state is heavily forested, too, but with evergreens that offer darkness, not shade. Our hills are steep and challenging. Our tunnels of trees offer no vistas beyond the road’s edge. I love the eastern landscape. And so I did enormously enjoy our drive through one hamlet after another to Waldwick, and Matthew’s Colonial Diner. Matthew’s Colonial Diner. Oak paneling and box-beam ceilings. Tasteful chandeliers, supplementing can lighting. Paned windows. Brick fireplace. A man cleaning the windows in the doors between the kitchen and the dining area. I mean, he was polishing that little window. So I looked at the floor, typically not a good idea. This floor was CLEAN. A clean, green carpet. Clean. Oak tables. Comfortable chairs. The waitress: dignity. Blonde hair, tastefully pulled back from her tawny face. Dark brown eyes. A touch of the cat, but controlled. Cool. Professional. We each chose from their ample menu a luncheon special, including a main dish, beverage and dessert. Mm-hm. Dessert. You can guess what I was thinking. But first, JerPie ordered a Florentine omelet, in which she detected a hint of dill, accompanied by home-fried potatoes. Better Half (BH) got a tuna sandwich on whole wheat, with slaw, while I opted for egg salad sandwich, identically accompanied. Those sandwiches were no less than 2 _ inches thick. Generous, homey, delicious sandwiches, not made out to be more than they were by the addition of way too much mayo. They were loaded with tuna and egg, respectively, with crisp lettuce for crunch. We each ate half, and took the second halves away with us. Matthew’s Colonial Diner was lookin’ good! For dessert, BH chose strawberry ice cream and received a most generous serving. Jerpie took the brownie, but I’m telling you, that looked more like pure chocolate decadence with a walnut on top. This so-called brownie was fully 3 by 1 _ inches, probably more. It was a double-decker, more than 2 _ inches tall, with dark chocolate icing. JerPie declared it “the best brownie.” You probably know that that was high praise, indeed. And I? I asked if there was cherry pie. “Yes, but it’s not part of the lunch special,” says our serving person. I’ll have the cherry pie, and coffee, please, says I. I think my dessert was delivered somewhat proudly, with a wonderful, smiling, “Here you are, Darlin’.” and look at this! Now, that’s presentation. That’s class. That’s diner pie???? Maybe in New Jersey. It’s fancy restaurant pie where I come from. Two florets of real whipped cream, a zigzag of raspberry puree, very pretty indeed. Ah, but let’s taste. Off comes the crust, and Jerpie detects a modicum of flakiness. Not like grandma used to make, but okay, it’s a commercial product. I like my crust sparkling with sugar, but this one was brushed with something shiny and sticky. I think that might be a regional preference. Is it milk? Egg white? Dunno. Cherry count: 17, which JerPie declares quite respectable. Taste: cherries are a good sweet/tart, flavorful mouthful. Matrix: Oh, no! Gelatinous goo which disrespects the cherries. It hints at refrigerator taste, it is cold, sweet and flavorless. This goo really has elastic strength, as proven by this photo, this forkful being held in place while I rummaged in my purse for my camera, removed it from its case, turned it on, aimed and shot, while that irascible loogy just hung there. That’s just not right! To grasp the difference between goo and juice, may I respectfully refer you to the painting of “The Slice” at the top of this blog. Certainly, the juice must be thickened, and there are tapioca, cornstarch, and flour people. But the gelatinous goo we keep finding in bought pies must be the result of that Modified Food Starch that table talk confessed to. And I have a theory about the reason for that. My cherry pie, before baking, has cherries piled as high as the piepan can contain. When baked, this mountain of fruit has settled down to the level of the top of the piepan. 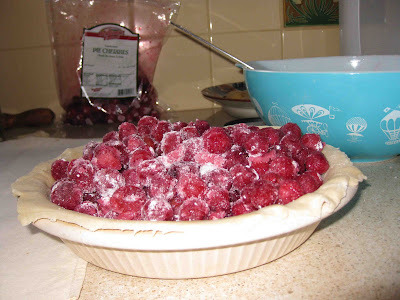 Can it be that filling a pie with gelatinous goo allows one to add cherries only up to the top of the piepan, knowing they can’t collapse, being held snugly in place by the goo? Perhaps an expert will check in on that score and elucidate us all. Back to you, Jersey Pie. Thanks for the opportunity to contribute. Whoa - that was an irascible goober! Not the entry - the photo. :-) Sorry I missed you while you were in town. I'd started oiling my bullwhip. Oh well...next time!